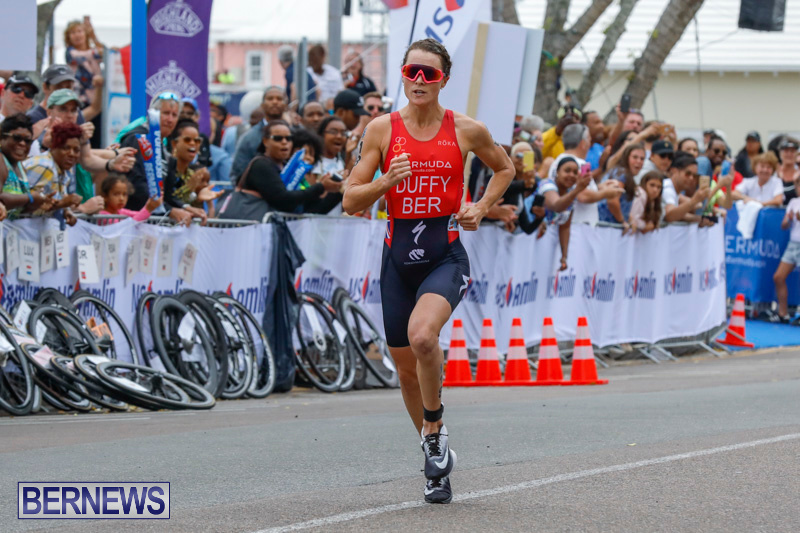 Reigning world champion Flora Duffy came in as the favourite and delivered in emphatic fashion, as she raced to victory in the MS Amlin World Triathlon Bermuda, becoming the first woman in WTS history to win a race after being the leader in all three disciplines. 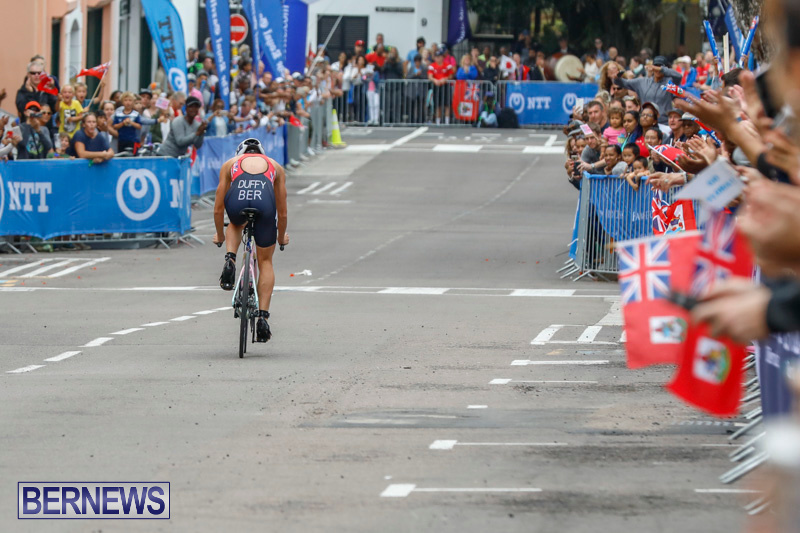 The gold medal earned on home soil was her first WTS win of the season, and she held the lead for the entire race, thrilling the thousands of locals lining the route who had come out in support of the Bermudian triathlon star. “I don’t think this moment is going to sink in for a while, but what I will say when it does is that this will probably be one of the highlights of my career,” Duffy said. 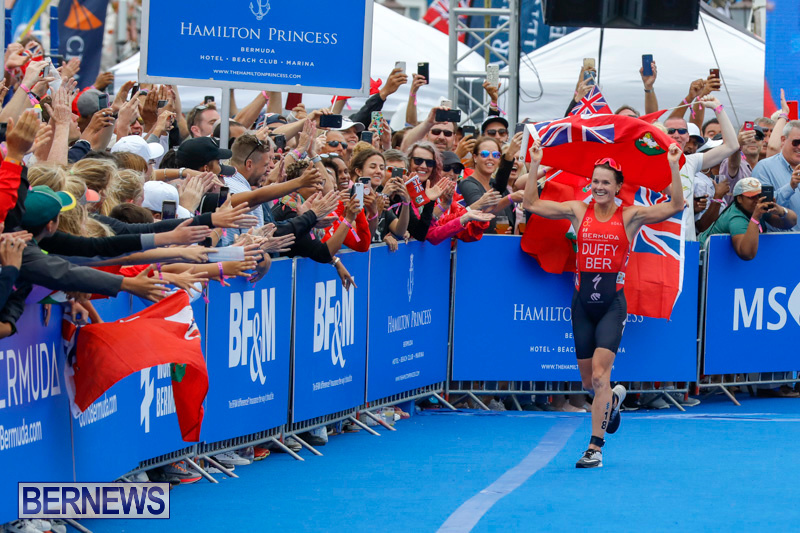 Collecting the leading position in the swim, bike and run, Duffy’s win on home soil also made her the first woman in WTS history to win a race after being the leader in all three disciplines, which included a 40-kilometre solo bike ride. “That wasn’t my plan, I wanted to get a small breakaway, that is why I pushed in the swim. Going up corkscrew I wasn’t really sure where everybody was, I knew Kirsten [Kasper] was there, I attacked it because that was my plan and I thought she would come with me, but she didn’t. So I thought, well I guess I am going 40km solo,” she added. Second place then went to Great Britain’s Vicky Holland after she won in a photo-finish sprint on the line with USA’s Katie Zaferes who took the bronze. 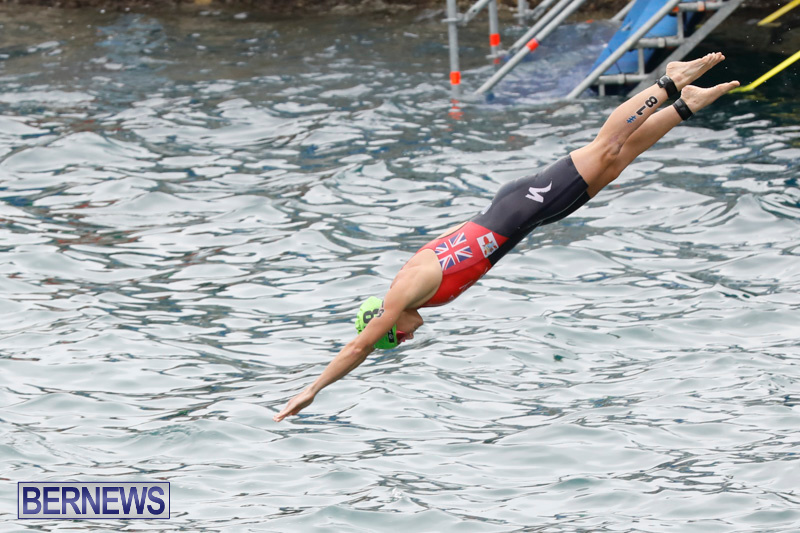 After the race got underway in front of an enthusiastic crowd, Duffy quickly moved ahead in the waters of Hamilton Harbour, and she held onto her lead and exited as the swim in the front, collecting the swim leader title for the first time in a WTS. Gliding through a swift first transition, Duffy headed out onto the bike course, and she pushed the pace, being cheered on by the home crowd as she held the lead throughout the entire bike portion, which included some 10 laps up Corkscrew Hill. 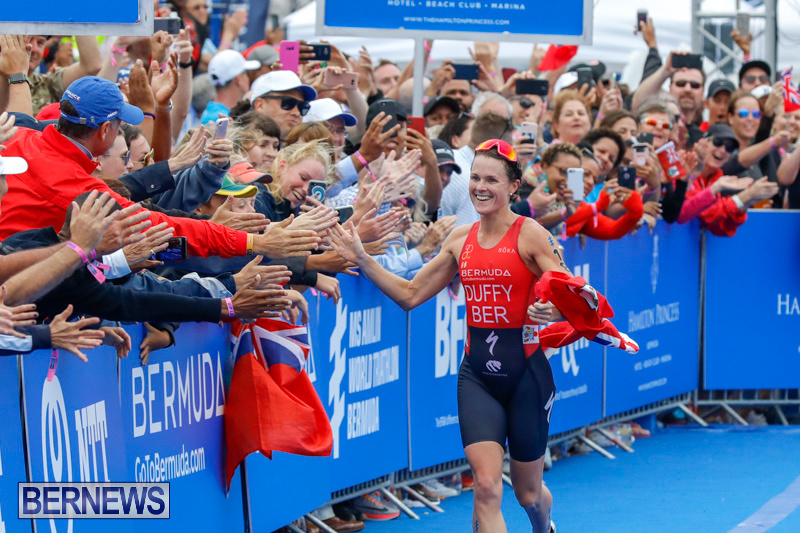 She flipped up her sunglasses and started to smile and wave at the crowd towards the end of the race, and grabbed a Bermuda flag just before she reached the finish line, earning massive applause as she secured the win. “I just want to say thank you to every Bermudian that came out to support,” she said after the race. So very proud of you and your achievements! You have represented your country well! Corkscrew Hill should be change to Flore Duffy Hill. FLORA!!! YOU HAVE MADE BERMUDA PROUD ONCE AGAIN!!! AND TO DO IT ON YOUR OWN SOIL IS OUTSTANDING!!!!! CONGRATULATION FLORA!!!! Brillant. Stupendious. Magnificent. So very well done. Well deserved Congratulations. You just inherited a ton more supporters and new Triathon fans!